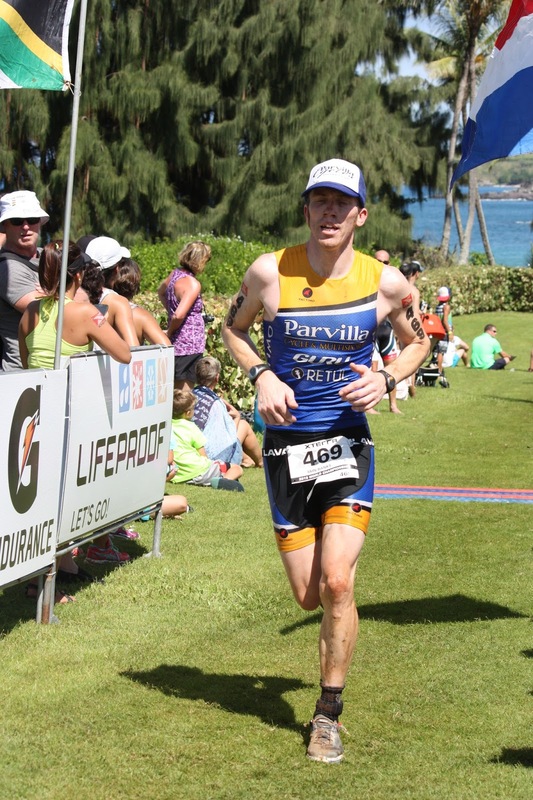 The Ramblings of an Endurance Junkie: Xterra World Championships (Maui) 2015: Race Report.....Learning some lessons! Xterra World Championships (Maui) 2015: Race Report.....Learning some lessons! I was nervous.....I hadn't been this nervous before a race in a while. It was a combination of things but primarily the fact that the pre-ride on Thursday had gone so horribly bad that I was questioning everything. Was I fit enough? Was the heat and humidity going to destroy me? 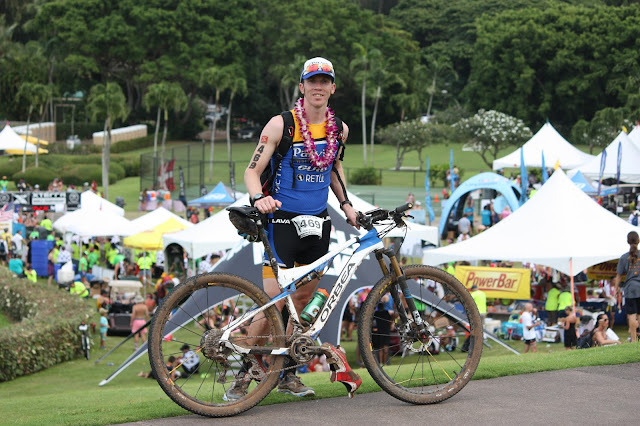 Had we come all the way to Maui for a terrible race experience? Yes the pre-ride on Thursday had been bad, I had bonked 5 miles into a 20 mile ride and it took a lot out of me to get back to the condo. As Sarah can testify I had the "sunken face" look that I only get when bad things are about to happen and that normally features some form of unconsciousness! It took the rest of Thursday and most of Friday to get re-hydrated and the small cramps to go away, luckily I remained conscious. 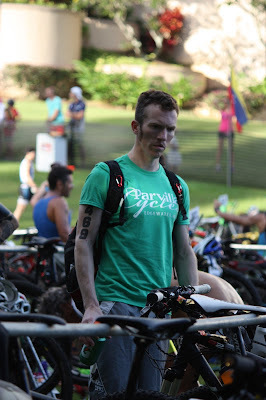 In hindsight knowing what the course and weather is like, riding the course in the heat of the day after a long day of travel was not a good idea. That is Lesson #1 for next time......yes, I said next time! 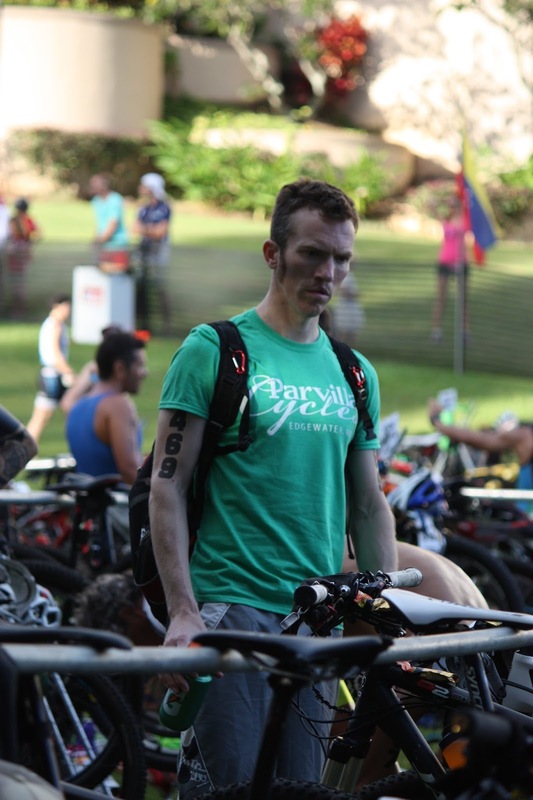 Trying to remember the rack location pre-race! I was also nervous as this was the bloody World Championships, not your local triathlon, this was 850 of the best Xterra racers in the World. Racers from 43 nations were all lined up along the beach, the race blessing had finished, the helicopter was flying overhead, this race was about to explode! At 9:05am the cannon fired and the men's wave detonated into the surf. Then the usual two things happened, firstly the nerves all went away and race mode was switched on and secondly I used the facilities in the open water. If those two things don't happen early in the swim then I know that something is wrong. So I was now calm now, at least inside I was, externally it was a fighting match until the first buoy at around 400 meters after which it settled down a bit. 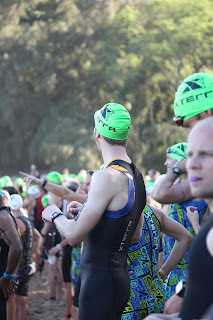 The M shape of the course meant that we exited the water after 750 meters (saw Sarah and Team Banks) and headed back in for the 2nd half of the M. A quick glance of the watch had me at 12 minutes so on course for around a 25 mins swim. The 2nd half of the swim was much cleaner in terms of contact and the water clarity. You could see all the way to the sandy bottom for the entire way, as much as I was hoping I didn't get to see any turtles. Apparently there were some around but not within my eye sight. T1 - getting ready for the bike. 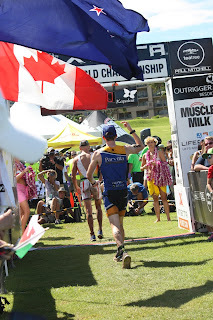 The run to T1 was a sign of the course to come....uphill all the way for a couple of hundred meters. The swim was just over 25 minutes and gave me a little bit of confidence that I was ahead of the majority and would get a cleaner course esp. on the first few miles which are all limited in passing opportunities. 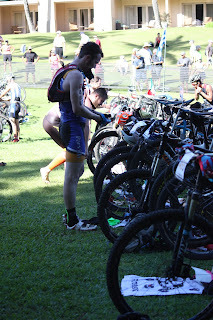 For this race I decided to wear my hydration pack rather than rely on a single bottle and the two feed stations. I wanted to be able to drink when I wanted rather than when the course let me. It worked perfectly and I was able to carry 1.5 Liters of First Endurance EFS for the duration of the 20 mile bike course (with 3500ft of climbing) and collected water at the feed stations to dowse myself. The key to my day on the bike was patience. Not to harp on about it but the Thursday ride had me wary and I needed to get to Razor Ridge in reasonable shape to have a good rest of the day. I purposely rode easy for the first few miles but to be honest the decision was partially made for me. Even with a decent swim the course was a little crowded to begin with and the risk vs reward factor on passing and riding hard on the singletrack was pretty minimal. As such I passed when I could and rode as even a pace as I could....steady but not necessarily all out race pace. The legs felt so much better and upon getting to the top of the first climb to Razor Ridge at mile 5 and then hitting the high point of the course at mile 7 it was time to hit the gas. 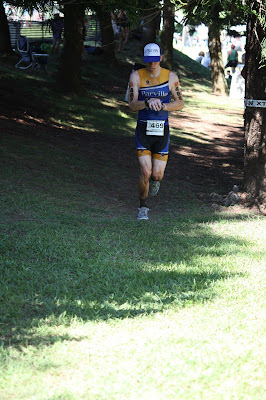 Descending from mile 7 at the top of the plantation was sooooo much fun! I knew the legs were good, the view was amazing, all I could do was smile and I couldn't stop smiling. It still makes me smile now.....here I was riding an amazing bike course (on an equally amazing Orbea) in Maui at the World Championships! 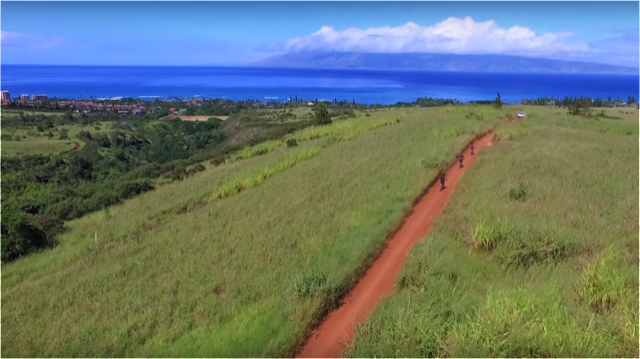 You could see down the mountain seeing riders slowly coming up, riders zig-zagging down the plantation roads, the resort and Molokai in the background, it truly is a scene that will forever be etched in my memories of this race. So heading back to T2 I was catching and riding away from riders and groups ahead. The patience had paid off and I was feeling pretty strong riding down the Lower Bowl section. 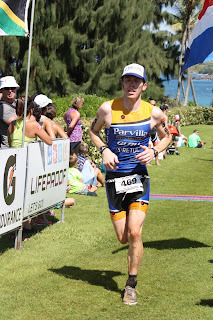 I ended up with a bike split just over 2hrs (2 hrs 3mins) but lost about 15-20mins to the top 10 in my age group. Another Lesson # 2 for next time....go hard the entire course. Now that I have raced the course and know that I actually had good legs after the pre-ride/travel, I would amend the race strategy. Without doubt I lost a lot of the time in those first 7 miles climbing and would be able to catch onto some of the faster riders in those earlier sections if I rode harder. Getting back into T2 just over the 2hr mark surprised Sarah and Team Banks (that's a good surprise though) and it was now onto the run course. Another 1300ft of climbing faced us over the 6.5mile course. Much of the climbing was in the first three miles and then it was a matter of letting gravity do the rest....perhaps a little bit simplified but you get the idea. Immediately I knew it was going to be a good running day. The legs were feeling pretty good, a combination of training, nutrition and a well-paced bike. Again knowing that the first half was all the larger climbs (thanks to Sarah and Dad's intel from their races the day before) I went out steady and was able to run all the climbs leading to the top of the course at the halfway point. Lesson # 3....push the run harder if the legs feel good. The great and encouraging part was that I was overtaking a ton of racers....many were walking the climbs and not looking in great shape at all. It was getting hotter out on the course so any opportunity to shove ice down the top was welcomed. Now came the fun part! From mile 3 it was all downhill, well mostly as there were some shorter climbs and a brutal road climb just before mile 6. A racer from Quebec and I were running a similar pace and were able to have some fun on the downhills as we were catching racers left, right and center....the more we caught the faster we went. Luckily we were in different age groups so didn't have to duke it out at the end but it made for a great 2nd half and again is one of those memories that I will never forget. Just before the finish is the famed beach run, a couple of hundred meters in the sands that we all started on a few hours before. I crossed the line in 3hrs 28mins, the nerves gone and a satisfying result. 28th in age group and 189th out of 775 that toed the line (including pro's) for a top 25% finish. There were certainly some lesson's learned in the build-up and during the race that I can use for future Xterra races and hopefully a return to the World Championships in Maui. Knowing how the race plays out and what the course is like is so critical that I would definitely change the training plan and the race plan for a return trip......this isn't a trip we can do every year (even though we would like too) so it's a two-year plan. It would be good to head back as a young 40 year old in the 40-44 age group in 2017. So now to start thinking about the 2016 season and race goals!